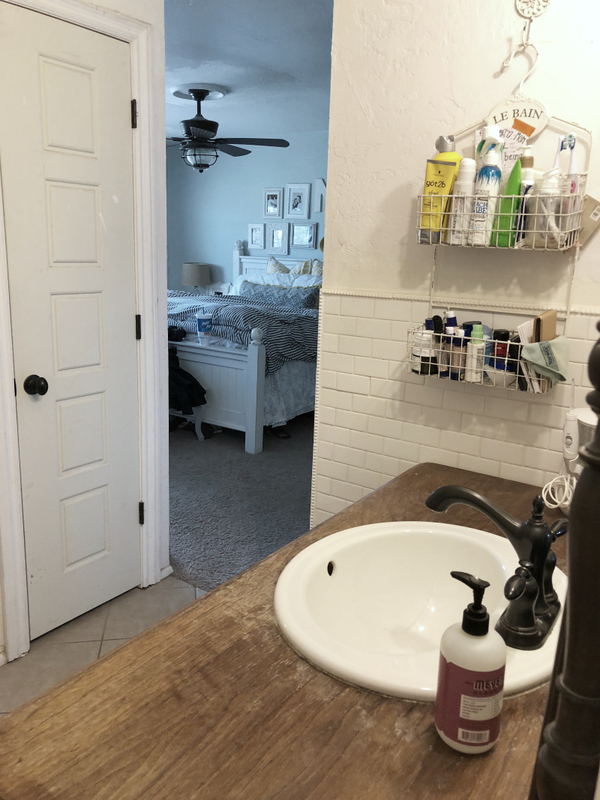 This is our first time participating in the One Room Challenge via Jeffrey Court and we are so excited to be inspired by others and check a much needed remodel off our list at the same time! What is the One Room Challenge? It’s hosted by Linda from Calling It a Home where she challenges bloggers to redecorate a room of choice in six weeks! There are 20 official participants, we’re guest challengers, excited for the task at hand! We all document our progress every week on our individual blogs, sharing the nitty gritty and step-by-steps. Want to follow along? Be sure you’re following us on Instagram@LollyJaneBlog as well as #JCChallengeAccepted. We have a super funky master bedroom. It’s from our 40 year old farmhouse and looks more like a hotel than a master? We recently got our house plans back and have decided to build a brand new master suite from our 1.5 car garage + family room, combined. THAT is going to be a major overhaul and we’re still finalizing details with permits and our contractor, can’t wait! 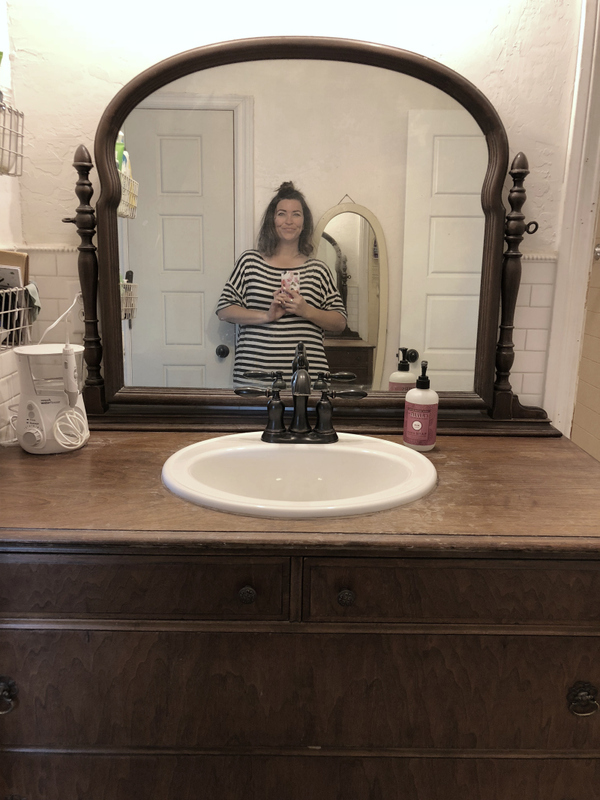 In the meantime, this weird bathroom is going to be converted into a guest bath, specifically for my lovely daughters. 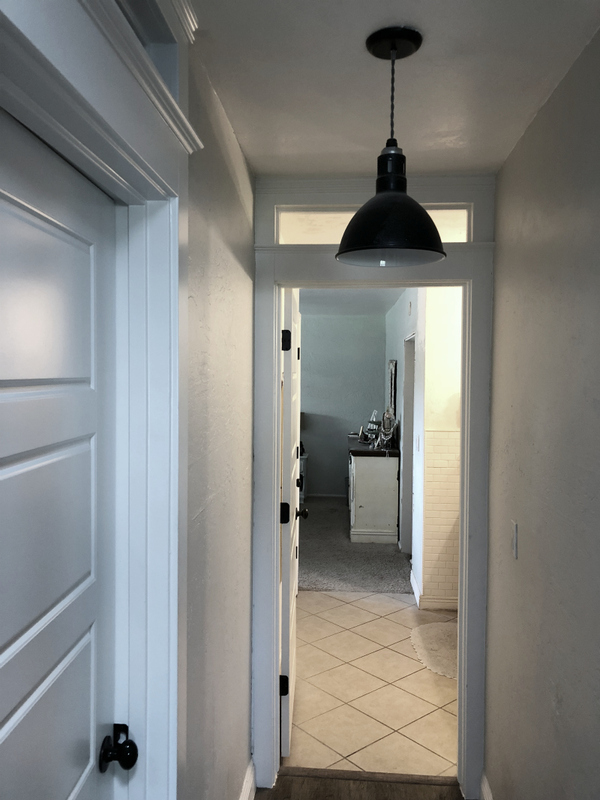 I’ll end these nasty before pictures with a pretty-ish one: our hallway renovation is my favorite, I love the transom windows and Barn Light Electric pendants! 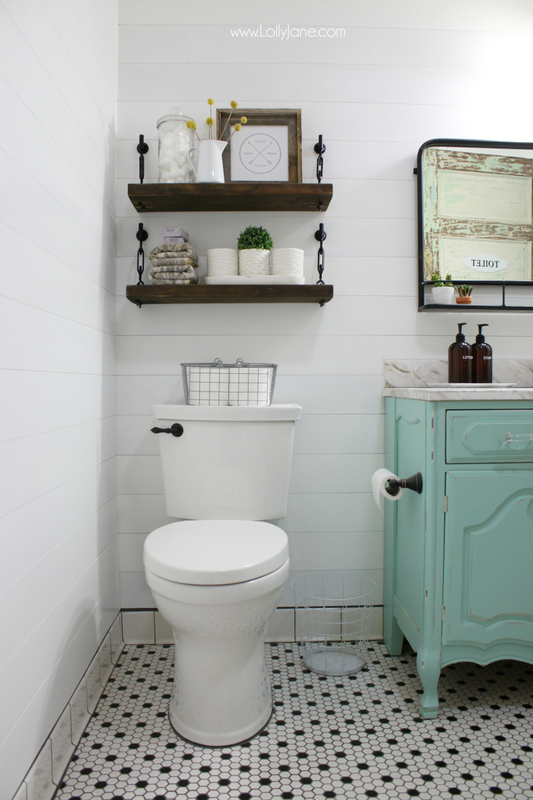 Our recent hall bathroom remodel was meant for the boys. 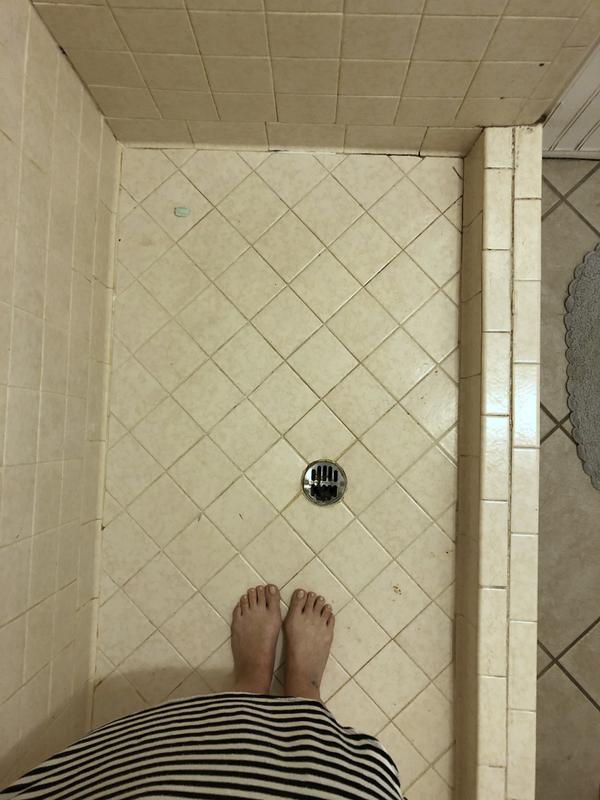 The walk out shower is super easy to clean which is a perk for those fellas. 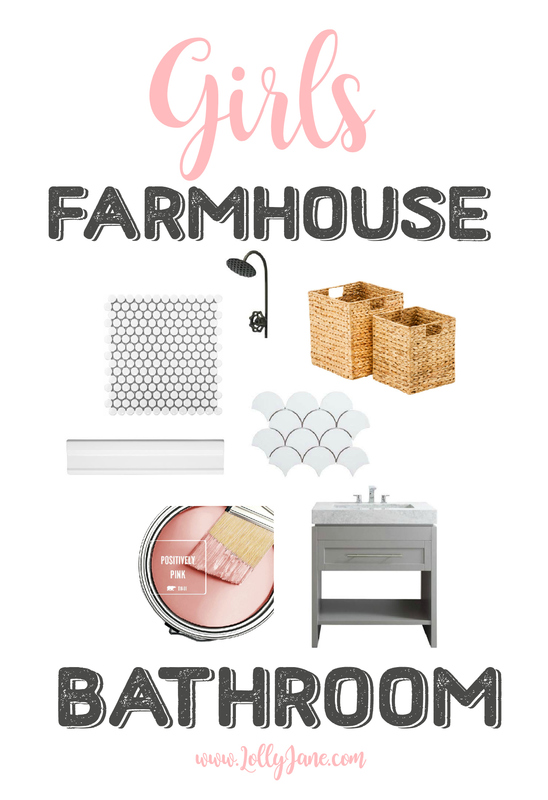 We’ll be replacing the girly shower curtain when this one is done 😉 The girl’s bathroom will have a similar look with white tile and gray grout but will have more feminine touches like floral wallpaper instead of shiplap. Perhaps I’ll swap gold finishes instead of my go-to oil rubbed bronze? Truth be told, I still don’t have a full plan… ha! We are the fly-by-the-seat-of-our-pants kinda people and the only thing that’s certain is the tile. SWOON! We’ll be using Jeffrey Court Glossy Pearls for the flooring. The Jeffrey Court Allegro White Fan will go in the shower turned bath/shower combo and the Jeffrey Court Allegro White Molding will go along the floor. Because durable is key here, folks! We’re dealing with teenagers and easy-to-clean is the top priority around this joint. 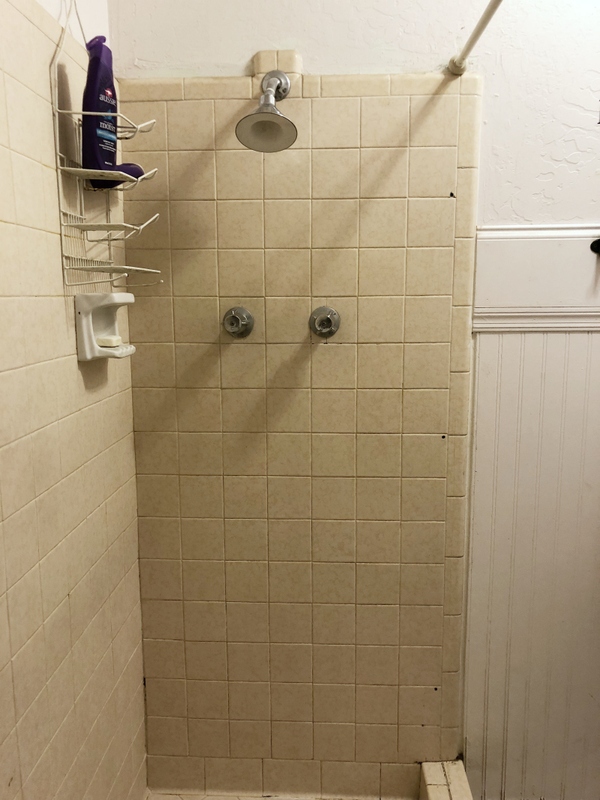 Build custom shelves next to shower. 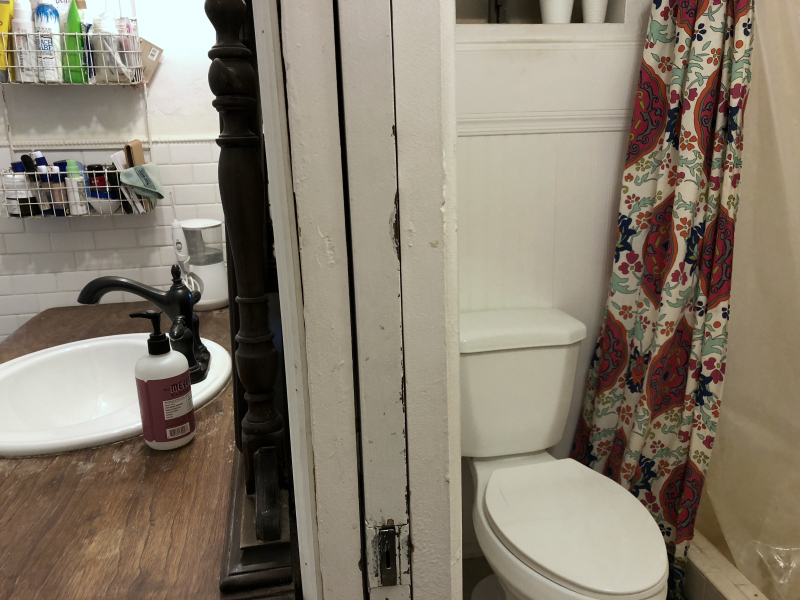 Tear down wall + pocket door. Move plumbing into the south wall. Build new wall on east side. 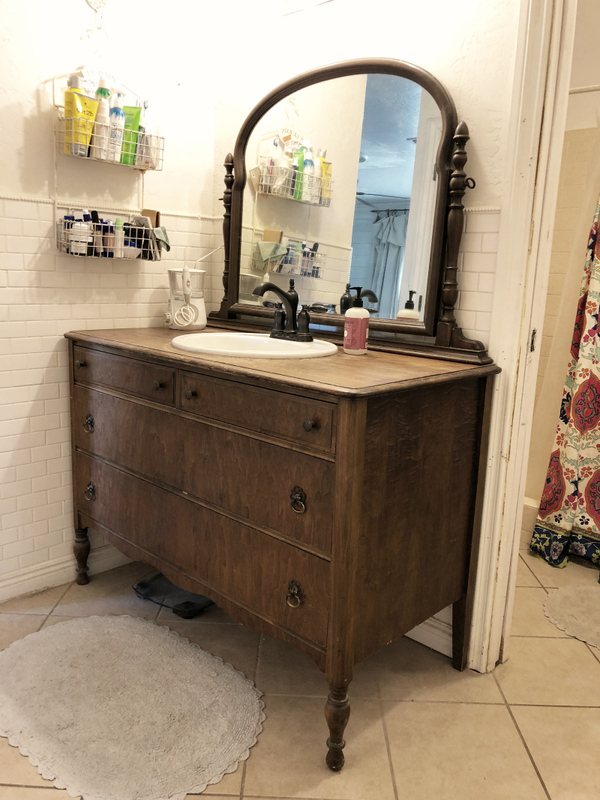 Build custom vanity + makeup table. Install custom concrete counter tops. 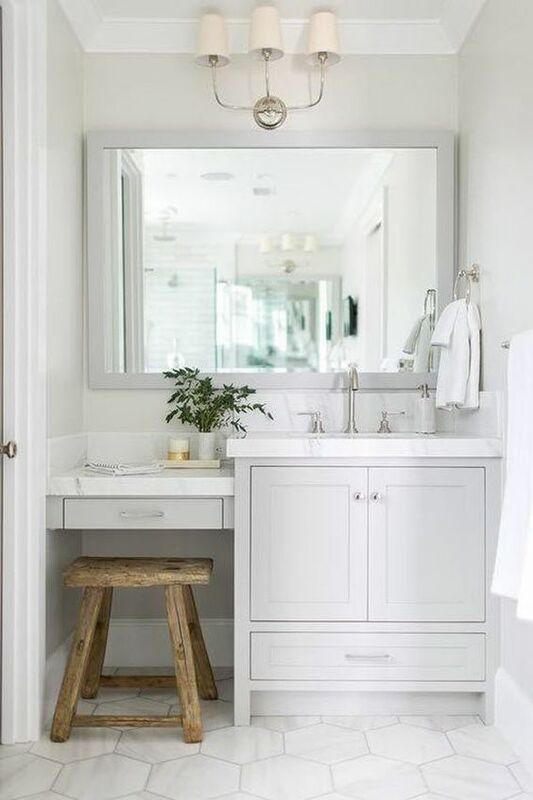 Vanity + makeup table inspiration. Perfect for girls! 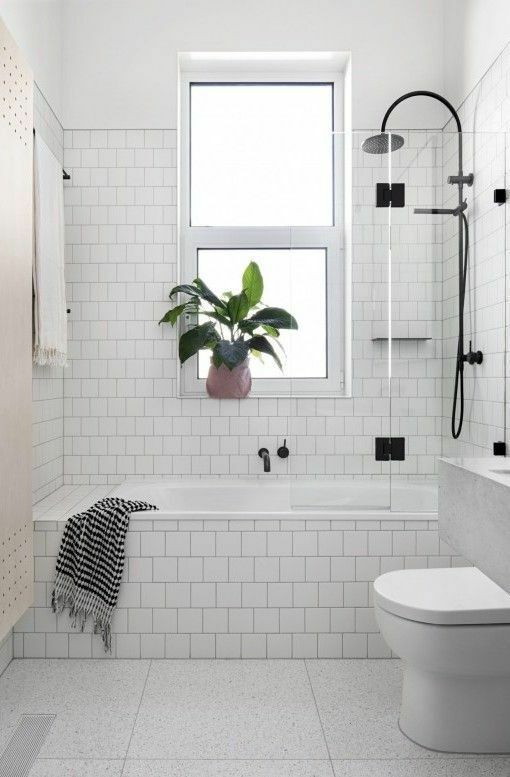 Tile bathtub/shower with glass wall. No shower curtain, wahoo! 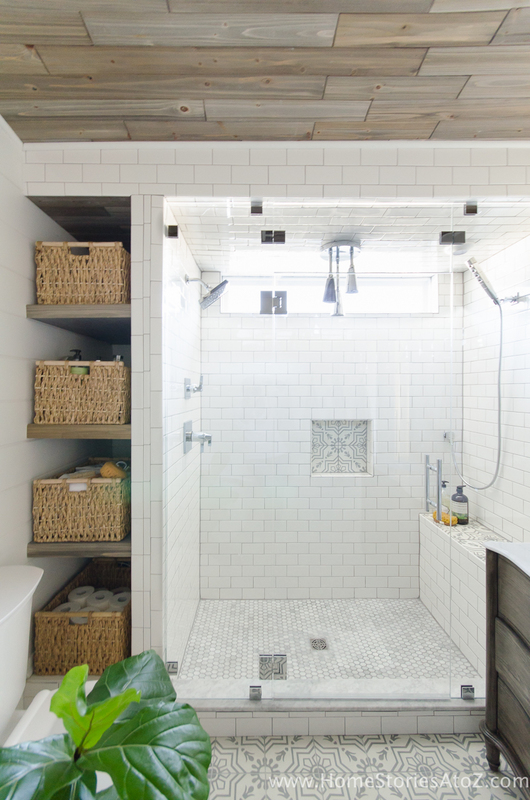 Storage next to the shower via Home Stories A to Z. Love using up dead space!